Lightened-up easy weeknight dinner in 30 minutes. 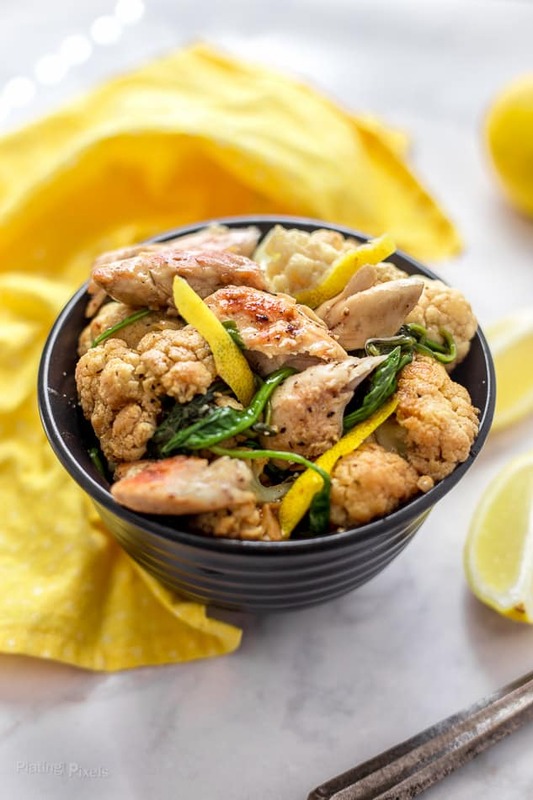 Healthy and Keto Lemon Chicken Cauliflower Rice Bowls are full of protein and clean ingredients without extra carbs and is gluten-free. I’m a bit obsessed with quick and healthy meals. Anything 30 minutes or less but full of unique flavor is a winner in my book. Even simple moist baked chicken breast makes a great healthy dinner option. Clean, wholesome, natural ingredients is a popular trend in homes today, including this one. Lightened up recipes have become the new comfort food. 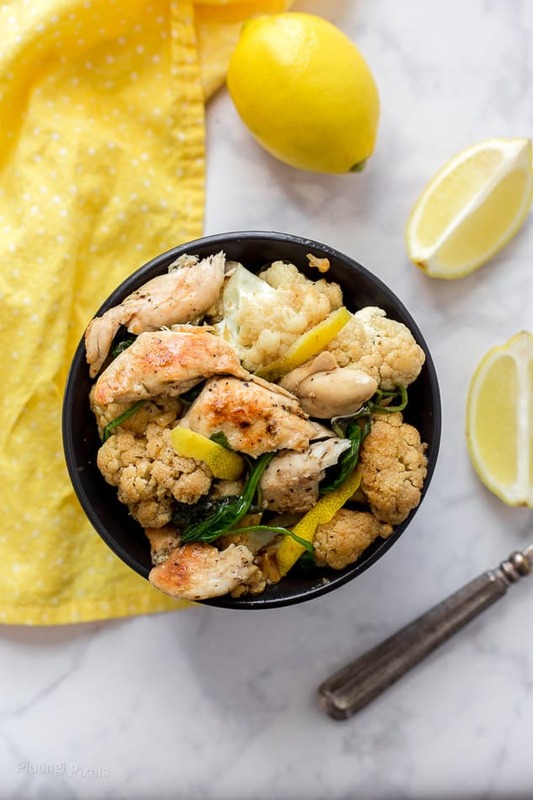 Lemon Chicken Cauliflower Rice Bowls are no exception. These “rice” bowls contain no rice, or grain-based carbs for that matter and fit into a keto diet. 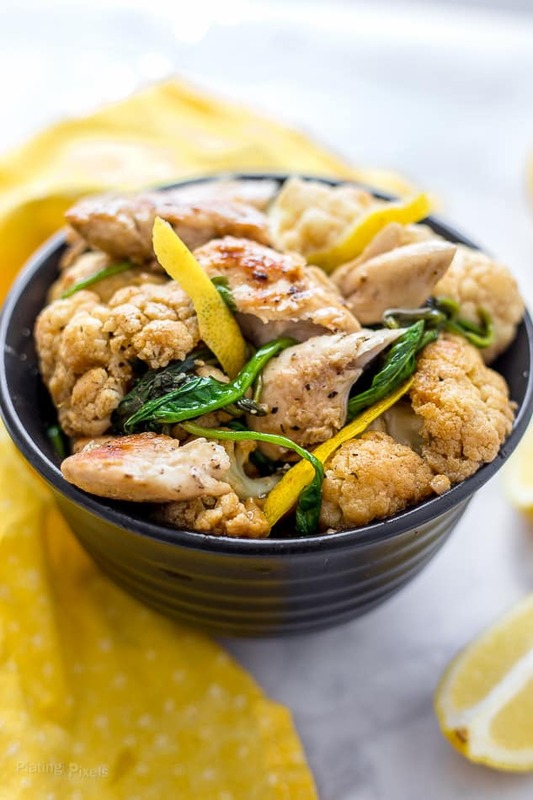 Instead, fiber and nutrient-rich cauliflower is the main base for this tasty lemon chicken dish. Plus it’s loaded with protein for a complete meal that’s low in calories but oh so comforting. This one is definitely being added to my library of rotating healthy weeknight meals. Ideal for feeding a hungry family as an all-in-one meal, or as leftovers for smart travel lunches. Since you’re using clean and natural ingredients the quality of protein in this recipe is important. I recommend fresh, organic chicken. These Chicken Cauliflower Rice Bowls are a simple way to add clean healthy eating to your daily routine. If you don’t have a food processor, use the grating method or chop cauliflower with a knife into small bits. You can also cook the cauliflower in florets if preferred. If you are watching your salt intake then go for homemade chicken stock or use a low sodium variety. Spinach can be replaced with kale or your preferred leafy greens. Leftovers are best eaten cold as a salad, it will store well in the fridge for around 2 days. The food processor method: this is the easiest way to make cauliflower rice and it takes all of 2 seconds. Simply cut the stalk to remove the florets of the cauliflower and place them in a food processor. Pulse the processor until the cauliflower resembles rice (a fine crumb) and you’re done. Pro Tip: Do not keep the food processor running as it’ll over-blitz the cauliflower and the texture won’t be right. You’ll have much more control by using the pulse button only. The grating method: If you don’t have a food processor then don’t worry; you can still make cauliflower rice using a grater. Use the coarse side of a box grater to create a crumb the texture will be slightly chunkier and it takes a little longer than using a processor but it still works really well. Cauliflower rice cooks much faster because it’s not a hard grain. To cook keto rice, simply add it to the skillet about 7-8 minutes before the end of cooking. It soaks up all the delicious flavors and you don’t need to touch it. You can also cook cauliflower rice in the microwave or by roasting it but for this recipe, I find adding it to the skillet is the easiest way and adds so much flavor. Note: You have the option to process into cauliflower rice or enjoy as florets. It all melds together into a wonderful, hearty and healthy dish. 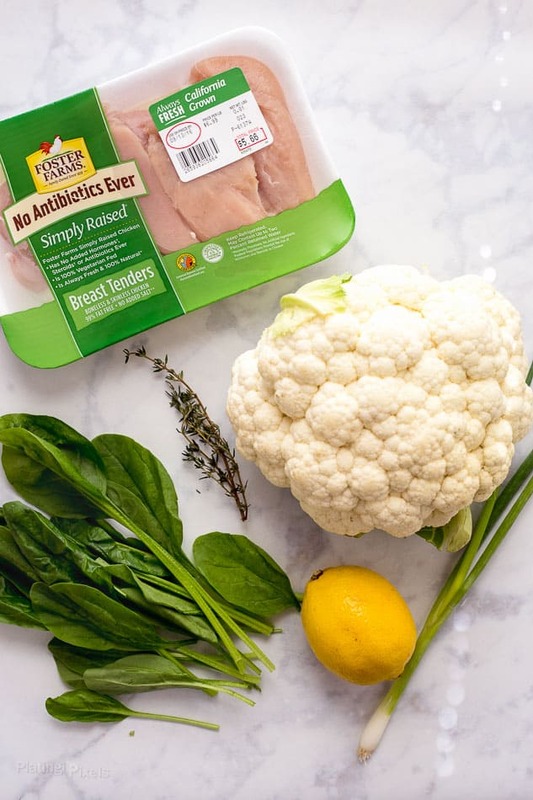 Making these Lemon Chicken Cauliflower Rice Bowls is as simple is pan searing chicken breast tenders in garlic and spices. Then use those flavorful bits to create a rich, savory and lemony sauce as a base to cook tender cauliflower and spinach leaves. Flavor profiles: Savory herbed chicken with a citrusy lemon sauce. Texture: Tender cauliflower with moist chicken pieces. 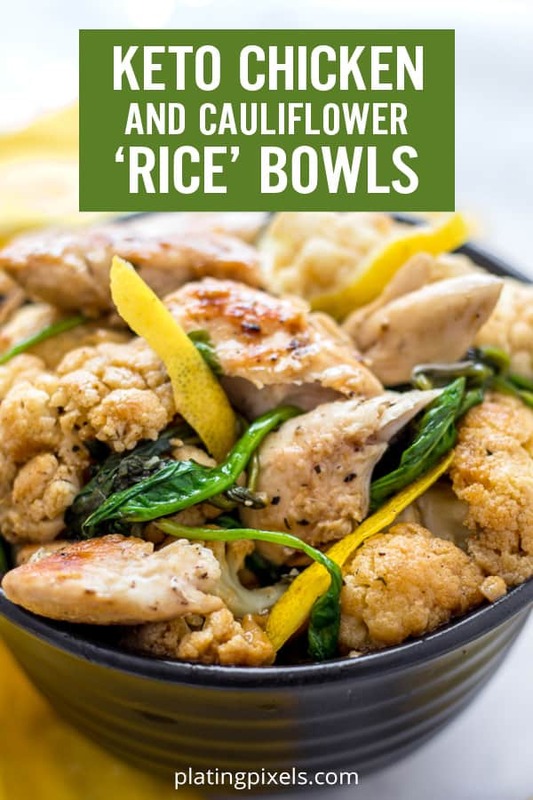 Low-carb and healthy Lemon Chicken Cauliflower Rice Bowls are full of protein and clean ingredients without extra carbs or gluten. Pulse cauliflower in a food processor until fine and roughly the shape of rice. Set aside. Heat olive oil in a skillet or large non-stick pan to medium-high heat. Add garlic and cook 1-2 minutes until lightly browned. Add chicken to pan and sprinkle with thyme, salt and pepper. Cook 7-10 minutes, rotating halfway, until browned and cooked through. Remove chicken from pan and cover to keep warm. Add chicken stock to pan and scrape bottom with a wooden spatula to loosen browned bits. Reduce heat to medium and stir in cauliflower rice and green onions. Cover and cook 5-7 minutes, or until slightly tender. Stir in spinach leaves, lemon juice and zest. Cook 2 minutes more until spinach is wilted. Divide mixture into bowls and top with cooked chicken breast. Since you’re using clean and natural ingredients the quality of protein in this recipe is important. I recommend fresh organic chicken. These Chicken Cauliflower Rice Bowls are a simple way to add clean healthy eating to your daily routine. For more tips on cooking chicken breast perfectly check out my guide here. Note: Recipe adapted from Better Homes and Gardens: Chicken. 2016. Print. What a great weeknight meal! I love cauliflower in all its forms! so much to love about this recipe! fast, healthy, and flavorful. This is such a great way to use cauliflower rice! And the lemon flavor is perfect! The moment I saw this recipe, I knew I had to make it. It’s everything I love in an easy, yet super tasty weeknight dinner recipe. Perfection. I’ll be making this again, thanks! This looks like a great, Keto friendly meal. I love all the flavors you have included especially the garlic. I always use more than a recipe calls for because I love it so much. This will be such a delicious dish to make! 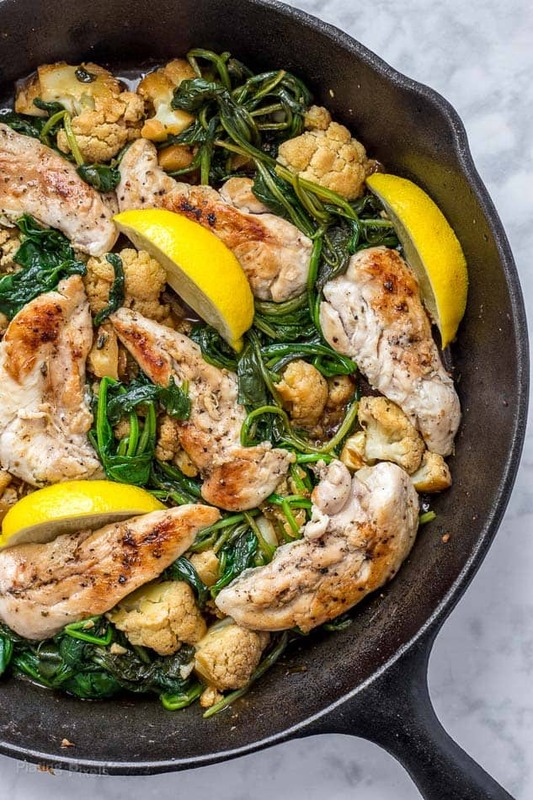 Cauliflower florets, spinach and chicken. Nice combo. Thanks. Such a gorgeous bowl! Love how perfect it is for a weeknight meal. Love the flavors of this – looks and sounds delicious!! What a perfect weeknight meal…easy, healthy and tasty! This is such a yummy one-pot recipe! I love using citrus to add flavor to dishes. So healthy and so delicious!